I've been reading about barrel twist and I'm trying to pick the best one for me. I've seen the charts on how 1:7 is for 62-75 and 1:9 is for 55 grain ammo and such. What I was wanting to know is how will 55 grain do in a 1:7 barrel? I've been seeing some deals on 55 grain, but I've been leaning toward the 1:7 barrel so that I can get the higher grain and reach out farther if I want to. Will 55 grain at 200 yards still be effective in a 1:7 20 inch barrel? If a M16A2 or M4 is zeroed at 25 meters with M855, and without re-zeroing fires M193; this is the difference in trajectories between the two rounds which isn't much. This graph is from Chapter 5 of FM 3-22.9. Yes it will work just fine. Awesome thanks. So that said, I guess 1:7 is going to be a great option? I want the versatility to go 400 to 500 if I wanted to. Twist rate is the factor for determining what is needed to stabilize a projectile on the basis of it's ogive, or length. The M855 has the same basic length as a 69-70gr lead core bullet of similar confirguration, but has a steel core, making it lighter & closer weight-wise to the M193 55gr lead core. The 1:7 twist isn't needed for the added stability in the M193, but it is not wasted. More stability is more stability, regardless to how you equate it. Also, faster than 'normal' twist rates often allow more stability when you want to shoot heavier projectiles from a certain caliber, like a 200gr from a .33 Blackout, needs or benefits from a tighter twist. Be leery of charts, most are derp. Length, weight, diameter, shape, center of balance and velocity are all factors in stability. Bullet design and construction and velocity and relative stability are huge factors in effectiveness. Make sure the data input is correct. 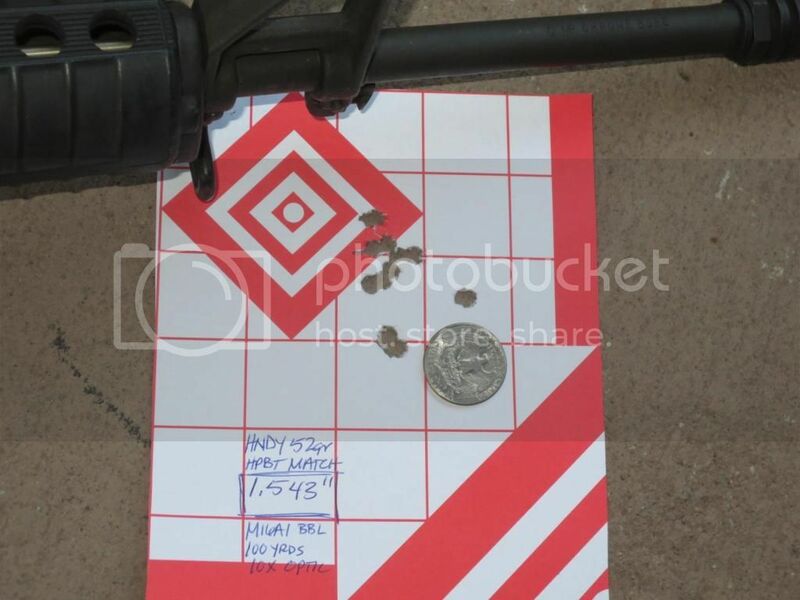 1-14 twist was found to be ideal for 55gr bullets in the early M16. Ideal until the arctic trials anyway. Turned out that at air at 20 below zero F at sea level north of the arctic circle is about as dense as it gets. Troop trials there showed that accuracy had degraded. The twist was tightened up to 1-12 and the groups went back to normal. The development and adoption of the M249 SAW, the M16A2 and the M855 round are highly interesting and enlightening subjects as well. You will be fine. 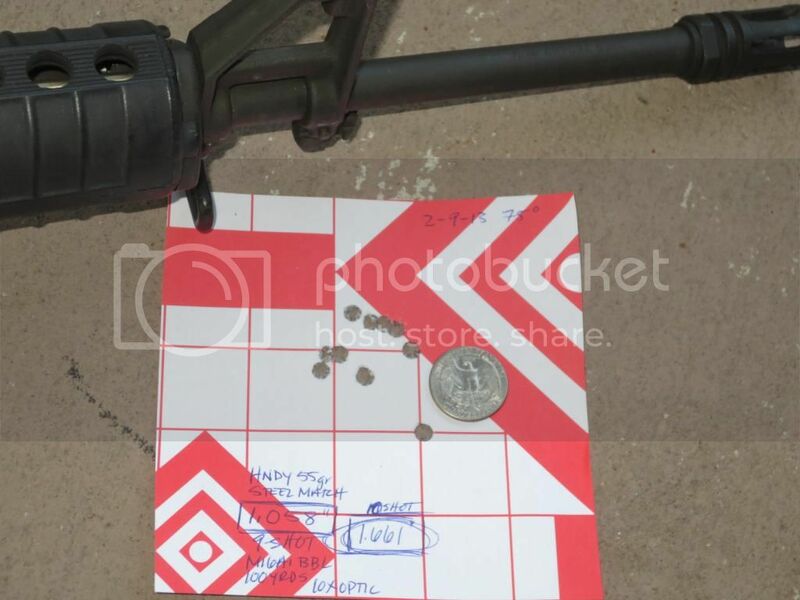 99% of the shooters would not be able to tell the difference between 1n7 and 1n9 firing 55 gr ammo. Weight, not grain; grain is a unit of measurement. That's like saying "I want my rifle to be lighter pounds" instead of "lighter weight." It's not the weight that determines a bullet's required barrel twist rate, it's the length of the bullet; it just so happens that LONGER bullets are usually HEAVIER as well. Except in the cases of non-lead bullets, like copper, which will be longer than equal weight lead bullets, and as such will require faster twist rates (than equal weight lead bullets) to compensate for that extra length. I almost typed something like that a couple days ago, but tried to let it pass. Then the thread kept coming up and the title was driving me nuts. 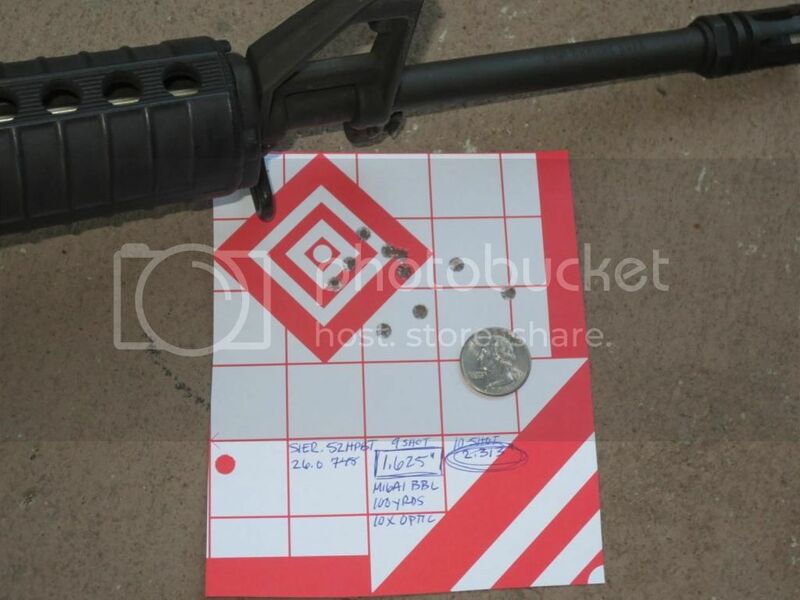 The 1:8 twist is the "ideal" twist for most AR15's in .223/5.56, because 1:8 will stabilize the heaviest bullets that are typical for magazine loaded length. If the guns purpose is specifically for varmint shooting and will only fire light weight projectiles, 1:12 to 1:10 will be more ideal. 1:9 was popular in civilian AR's for YEARS because it was a good compromise twist rate for the most commonly available bullet weights (lengths) from 40gr up to 69gr. Some 1:9's will stabilize 75 and even 77gr bullets, but those are not always the norm. 1:7 became popular because of two camps primarily: "I want exactly what the military has" and "I want a twist rate that will shoot any bullet I might come across"
Sorry about the mayonnaise, guys. the difference between 1:7, 1:8 and 1:9 twist rates is mostly moot for most civilian shooters. picking one or the other is more critical for bullseye match shooters who shoot specific loads match to their barrels and known distance targets. so unless your looking for fraction MOA accuracy i wouldnt be concerned by it because they should all stabilize well enough. I disagree. Most 1:9 barrels will not stabilize 77gr projectiles, and I shoot 77gr SMK's. I am not a bullseye match shooter. I simply like to reload and find the 77gr SMK's behind Varget, repeatedly are the most accurate load for me, at any distance. IMO....Get an AR with a 1/7 twist barrel. Then you almost don't have to worry about the grain weight of your ammo. 55gr. is the minimum bullet weight for 1:7 barrels I believe. I use 55 gr all the time no issues. There is no such thing as "minimum bullet weight". With a 1:8 barrel, exactly what bullets do you have to worry you cannot shoot? Weight; just weight. You don't tell people not to worry about the pounds weight of their rifle, do you? Just weight. Let us use the correct terminology of mass. Mass, velocity & sectional density all play a role as does barrel length. As B44t eluded to, atmospheric density impacts this as well. No easy solution other than to say try several with what you want to shoot & pick what works best for your application. Bullet length plays one of the bigger roles with twist rate than the other factors. Or rather, it's one of the factors that the shooter can more easily control. Sectional density, barrel length, powder charge, atmospheric conditions, bolt lockup, and tons of other factors play a role as well, but the twist rate and length of the bullet are two easy ones for the shooter to adjust. The length of the bullet tends to correspond to the weight of the bullet when it's your standard lead core with copper jacket. The heavier the bullet, the longer it's going to get to fit more of the material used while retaining the same diameter. That's why heavier grain bullets work better with a 1:7 twist rate. 1:7 tends to do well with 69+ grain bullets because the longer length stabilizes better with that twist rate. 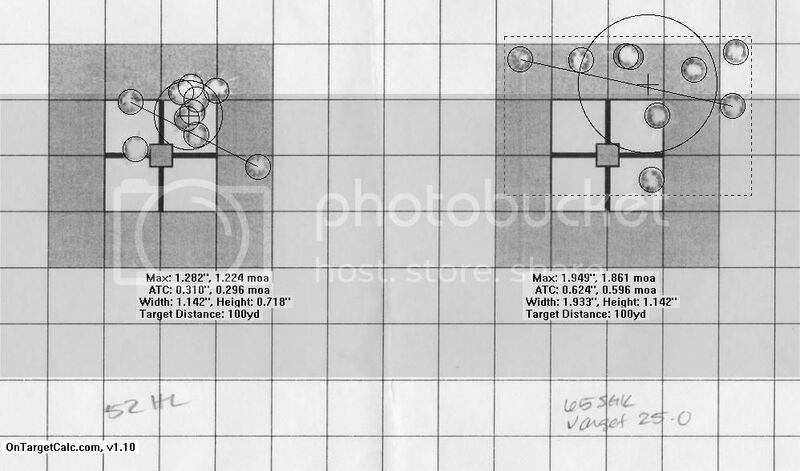 Meanwhile, 55gr bullets, which will be shorter, will do ok, but you may be getting anywhere between 2-4 MOA accuracy at 100 yards, which translates to a 2-4" grouping. That'll open up further at 200 yards. I know that 55gr Wolf Gold gives me a 2" group at 100 yards. PTAC barreled upper, YHM free float rail, stock trigger, and a 3 MOA red dot. 1:9 stabilizes 55gr fairly well, and I've seen my friends shoot within 1 MOA at 100 yards with their AR's. Nothing fancy and no custom loads: PSA and PTAC barreled uppers, free floated handguards, stock triggers, 2 MOA red dot on one and a 1-6x scope on the other, and factory ammo. If you want to really get the most out of your rifle you can start reloading ammo to find a bullet and powder charge that works best with what you've got. Also, keep in mind that some "specialty" bullets will have their own set of characteristics. Solid copper bullets, while lighter weight, tend to be longer, so you can't go by bullet weight alone with all ammo. 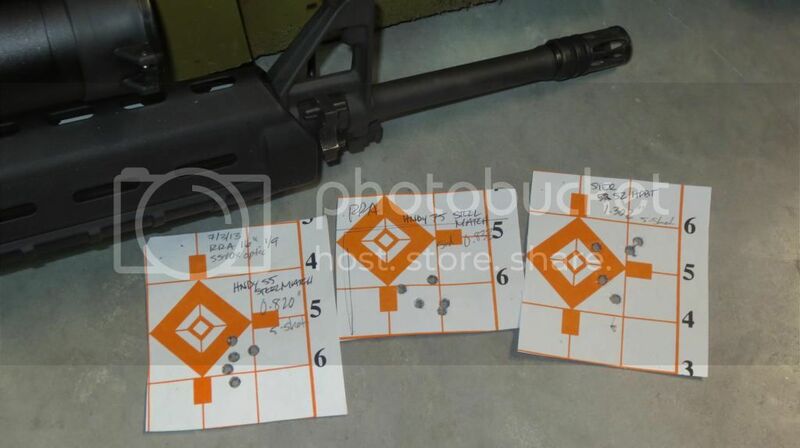 It's a good starting point for figuring out what your rifle may like with standard ammo though. As others have already stated for most recreational shooters 1:7 & 1:9 twist rate will work fine with 55 gr. I've shot thousands of reloaded 55 gr out of both barrel types without any problems and very decent groupings. This is spewed all over the net and fun shops everywhere and it needs to stop already (not to ridicule you but whomever started this nonsense). I personally shoot 45 grain nosler ballistic tips with some regularity out of 1/7 and those little bastards are some of the most accurate loads I've seen in factory offerings. The only time I've ever seen issues is with some of the ~35 grain ultra thin jacketed varmint loads when centrifugal force gets the better off them and they come apart right out of the muzzle. Shaulwolf, nice to see you finally made it over here. Federal 69gr Sierra Match king (top group) and IMI 77 OTM Razor core (bottom group). 10 rounds of the new IMI 77 grain Razor Core ammo. This 1/9 rifle did okay with 75 grain, but not very well with 77 grain. 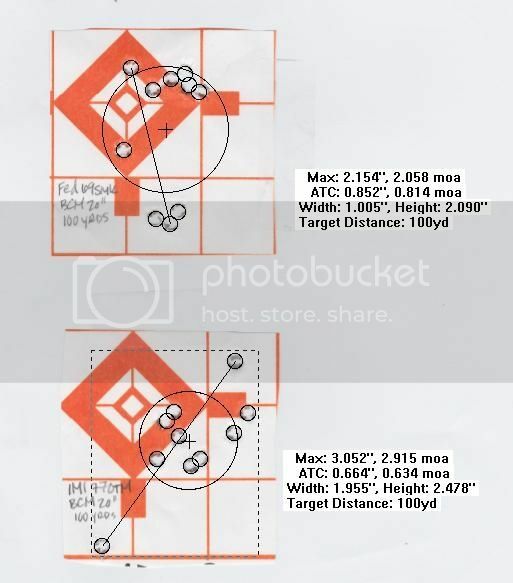 1.543" Hornady 52gr HPBT Match - giving 1.472 MOAand Mean Radius of 0.472"
1.661" Hornady 55gr Steel Match or 1.058" without one flyer, giving 1.059 MOA and Mean Radius of 0.427"
The 1/12 shoots the light stuff really well. It can't handle 60 grain or higher. The 1/9 shoots the light bullets well, and mine did decently with the 75's, but not too great with the 77's. The 1/7 shot all the loads well. All of them. It gave up no accuracy to the faster twists even with lighter bullets. In fact, it shot the 52 grainers better than the 1/9 and the 1/12. Someone else said " the 1/9 has no benefit, and the 1/7 has no disadvantage"
What barrel twist would you recommend for 40gr V-max 223 rounds? Some of those are hard to find. Thanks, that what I was thinking as well. Good to have a confirmation. Yes, those twists are hard to find. WOA has a 16" SS in 1:12 and Green mountain has an A1 Gov't barrel in 1:12 as well. I'd give a call to compass lake, white oak, and Fulton armory. Fulton has a kreiger listed in 1:13 twist, but it is spendy. I bet there are others out there who can do this for a good varmint barrel. Oly arms use to make a stainless ultra match in 1:10 that was a frwaking tack driver. A bit heavy, but very nice indeed. I like it a lot and I guess it's the best way to go for my application (range) and build.